How to Make Healthy Burgers Tasty? Turkey burgers can be a great option for a high-protein, low-fat cookout. But what about their flavor, which often gets a bad rap for being overly dry and bland? 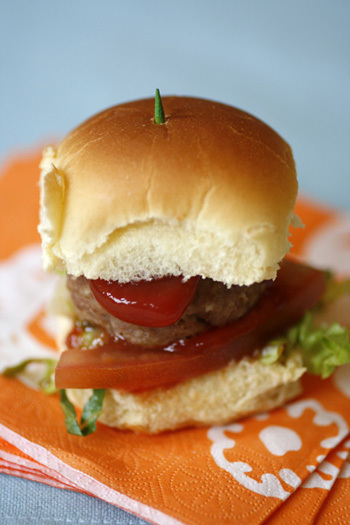 In my latest post on AOL, I go through a quick Turkey Burger 101 Guide. Dark or Light? What turkey meat to buy? The Moist Maker: How to deal with turkey’s low fat content? Flavor Savor: How to boost turkey’s flavor? Best Buns: What to look for when buying buns? Just place the turkey burgers on a pre heated grill. I would grilled 10 to 15 minutes, depending on how much meat you use or what you add in. Cut into one to be sure. I like to add thawed frozen spinach,garlic, italian herbs, and some feta cheese then top it with tzatziki for a Greek style turkey burger.